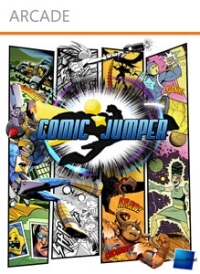 Comic Jumper XBLA tries to splice comic and videogame into parody. But poor writing, sexist jabs and an overuse of irony make it feel more like Frankenstein than modern science. 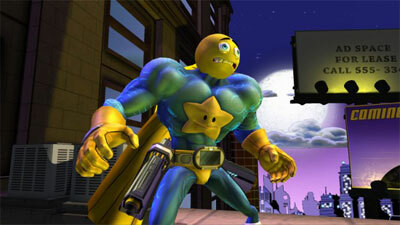 As a side-scrolling beat 'em up come shooter, Comic Jumper had my attention early. The overbearing presentation and loud bickering characters screamed at me to pay attention and marvel at the developers 'funny' self-referential nature. I found so much wrong with this game that it was a struggle to put my thoughts in order. From the combat mechanics to the writing and characters there was little worthy of praise. Comic Jumper's soul is about as bitter and relentlessly anti-female as anything I've had the displeasure to experience. The comics in question are cliched, stone-age examples of the medium - full of awkward and creepy attitudes towards women that came close to sickening me. 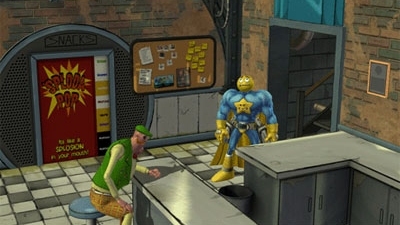 For a game that's primarily about parody, the soul of Comic Jumper after being let down by its shallow game mechanics, has to rely on the writing being nothing short of excellent to pull it through. It fails utterly because the comics in question are cliched, stone-age examples of the medium - full of awkward and creepy attitudes towards women that were offensive with their repetition. The second level sees a feminist character being portrayed as delusional and misled. This character is also the target of sexual innuendo and objectified by the protagonists as if this is ok when done in a 'funny' way. It's clear that the direction Twisted Pixel were going for was either horribly implemented by their writers or they have a serious problem with women. Things are stretched to breaking point in the Manga parody. Of course, this being based on something Japanese, elements of sexualised tentacles, Hello Kitty and Unicorns are labelled over the level. It's not just the game playing fast and loose with this nuanced art style, but that it does so with gleeful distaste. It seems that the writers either knew nothing about the source material they were trying to parody, or just didn't care. There's no soul here to discover, only frustration, concern and a blinding migraine. I'm sure many people will enjoy the base humour here and easily look beyond my concerns - reminding me "it's just a game" no doubt. But this is all so soulless. Hiding dubious moral standards behind shallow gameplay and relying on constant knowing winks to the camera, the game feels one dimensional and juvenile. To my other half Comic Jumper appeared simply sexist. There's no soul here to discover, only frustration, concern and a blinding migraine. Adam Standing writes the Soulful Gamer column. 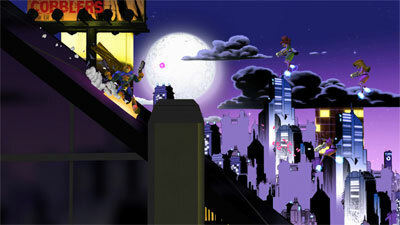 "Soulful gaming is found in a myriad of places. Games that tell a meaningful story with believable characters. Games that tackle issues larger than the latest run and gun technology. And for me in particular, games that connect me to an inspiring story often quietly overlooked by other players."